Apple and Cherry trees require at least one additional apple/cherry tree of a different variety for pollination. Quantities limited, order early during the sale! As a reminder, a postcard will be mailed to you two weeks prior to pickup. Friday, April 19, 9:00 a.m. to 6:00 p.m. and Saturday April 20, 9:00 a.m. to 11:30 a.m. Please bring postcard to pickup, thank you. Click on any image to see a larger, more detailed version. Honey Crisp EMLA7 rootstock: Fruit is mostly orange-red with yellow background. Crisp, juicy, sweet-tart has a rich flavor. Size averages 3” plus. Outstanding winter hardiness. Ripens mid-September. 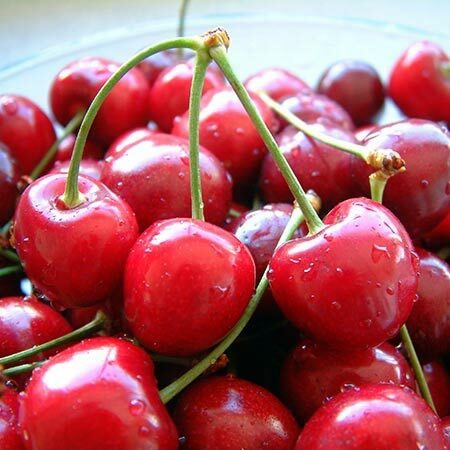 Black Pearl Sweet Cherry Gisela6®:: among the best early season cherry. 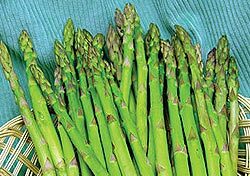 Exceptional flavor, is extremely firm and crunchy. It has amazing storage qualities, hardy & canker resistant. Medium in size. Needs pollinator. 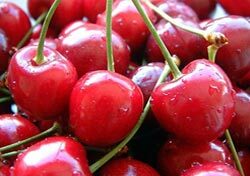 Montmorency Tart Cherry Mahaleb: considered the best tart cherry for the market. The fruit is bright red & medium in size with a clear, juicy flesh. Self-fertile, winter hardy & very productive. Self pollinating. Ulster Sweet Cherry: Sweet. Flesh is dark and of high quality. Fruit is large, dark red, and firm. Needs pollinator. About Rootstock: Rootstocks are plants with pre-established root systems onto which a cutting or a bud from another plant is grafted, allowing for control of vigor and/or disease-resistant abilities. 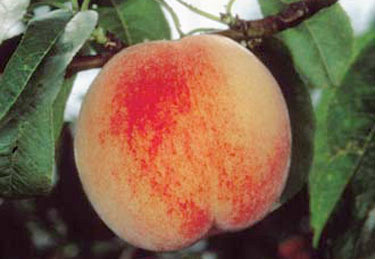 Coralstar Peach seed: a large beautiful freestone peach with 80% red color that matures mid-season. The flesh is firm with won-derful flavor. Holds well on the tree, is hardy & resistant to bacterial spot. Self pollinating. 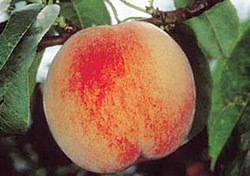 Red Haven Peach seed: One of the easiest & tastiest peaches to grow. Hardy & very productive. Large, freestone fruit, very juicy & sweet. Good for pies, canning, cooking or baking. Ripens in June to July. Self pollinating. Height: 12-15 feet, moderate to rapid growth rate. Loam, sand, full sun. About Rootstock: Our peach and nectarine trees are grown on industry standard Bailey rootstock. If we need to purchase peach trees to supplement our own inventory, these trees are typically grown on Lovell rootstock. For a traditional, open center planting we recommend spacing the trees 12-14’ in row and 20’ between rows. For perpendicular V training, the recommended spacing is 6’ in row and 20’ feet between rows. Bartlett Pear OHXF 87: A favorite dessert & canning pear. The large fruit has a smooth, attractive appearance that is highlighted by its golden yellow color. 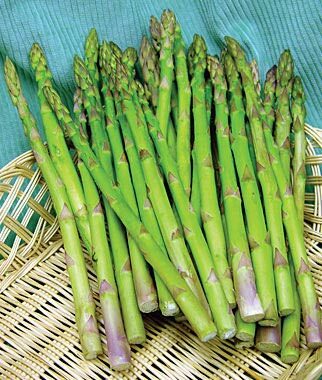 This variety bears young & is pro-ductive, strong, & has a tendency for compact, upright growth. For best production use pollinator, Bartlett will pollinate with all other pears except Seckel. Flemish Beauty Pear OHXF 87: A large, highly flavored variety that produces tasty fruit. The skin is creamy yellow in color, some-times lightly blushed with bright red. Vigorous & productive. Needs pollinator. All of our Asian pear varieties are grown on Betulaefolia rootstock. This rootstock is vigorous, well anchored and drought tolerant. The recommended spacing for plantings on this rootstock is 12’ between trees in the row and 20’ between rows. One of each variety needed for pollination. Soil pH level of 6.5 - 6.8 is recommended for all raspberries. 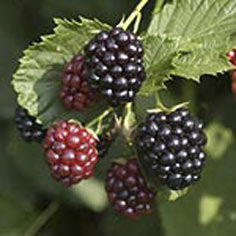 Jewel - Black Raspberry: Produces excellent yields of superb-quality berries. The fruit is glossy-black in color, a large size & have a rich rasp-berry flavor. An excellent choice for use in jams & jellies. Winter hardy and reliable. Red Raspberry, Caroline: Most productive ever bearing red raspberry Caroline has a larger berry than Heritage & is more productive, with a rich, full & intense flavor. It is a very vigorous variety, with more toler-ance for root rot. The farther south you grow it, the earlier it will ripen. Will not tolerate high heat or drought. Nova Red Raspberry: Summer bearing early to mid season. Ripening gradually over a long harvest period. Very winter hardy & vigorous. Ber-ries are firm, medium to large in size & have a good shelf life. Anne Yellow Raspberry: Fall bearing yellow raspberry, Anne is a large-fruited fall bearer that ripens at the same time as Heritage. Fruit holds a pale yellow color & is proving to be highly productive, excellent size, appearance, & very sweet flavor. Will bear some fruit the first fall of planting year, & either summers or falls after that depending on how it is managed. Triple Crown Blackberry: thornless; semi-erect. Large fruit, with excellent flavor. Ripens very early. 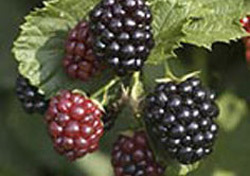 A good choice to help extend the blackberry season for home gardeners. Allstar Strawberry: Recommended for beginners & home gardeners. Produces a good crop of large, light-colored sweet berries. Firm fruit makes this vari-ety excellent for fresh eating. Highly resistant to red stele, with intermedi-ate resistance to Verticillium wilt. 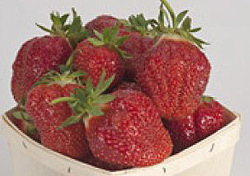 Cabot Strawberry: late-mid season recommended for home gardeners and direct marketing growers. 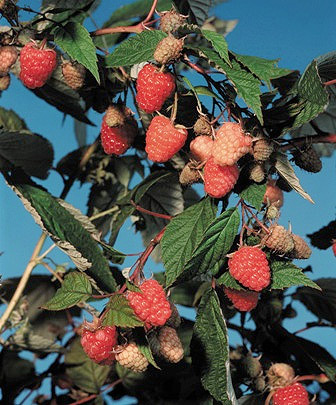 Cabot is known for its huge berries, excellent flavor, winter hardiness and disease resistance. It is by far the best tasting big berry ever! Plants are vigorous but may not run freely, indicating closer spacing may be required. 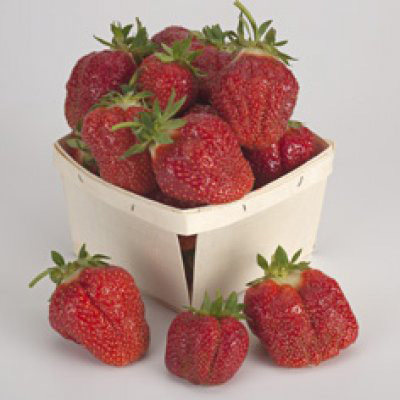 Honeoye Strawberry: Early-mid season, recommended for home gardeners. 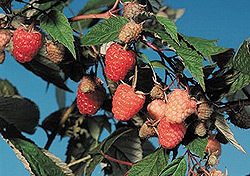 The large berries are easy to pick & produce high yields over a long fruiting season.